It’s the age of mobile! “This past quarter, by their own estimations, Walmart reported that 70 percent of the traffic to their site during Thanksgiving weekend was from mobile devices, and Target reported that 60 percent of their holiday site traffic was from mobile”. Mobile devices have become one of the fastest growing, rapidly evolving global markets. That being said, it is vital for marketers to incorporate a specialist mobile strategy into any SEO campaign. Mobile and desktop SEO should be treated differently. “The on-demand and “mobile” nature of mobile devices mean that peoples’ search queries are quite different when they search from a mobile device as opposed to a desktop device”. 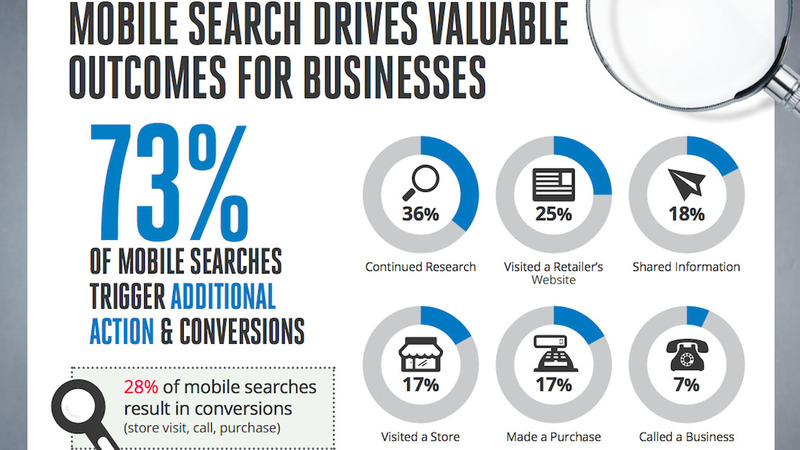 Often, most mobile users begin with a general search for the information they are seeking. Marketers should aim to optimize search rankings by understanding their target audience. Also make content mobile-friendly! “If people have to zoom and reposition the screen, it’s discouraging and can cause them to leave the page. This is the top reason to consider a separate optimized site where you can streamline content and use large text or smartphone-friendly media”. One way to see if your site meets Google’s mobile-friendly guidelines is to just search for the site on a mobile device. Google recently added the “mobile-friendly” label to organic site listings for sites that meet their guidelines. Simply use the Google Mobile-Friendly Test to identify what needs changed. Mobile SEO optimization is a must for your business! Check out the compelling infographic below. How do you use mobile? Do you usually select one of the first options? What bugs you about mobile? Negative Reviews? Don’t Get Defensive!